A science fiction rock opera written in the 1970s by a teenage girl! After a future war kills almost everyone, a woman reprograms an android to be her boyfriend. This story was conceived and begun in 1974 – 1975, when I was a senior in high school. At that time, inspired by works like Jesus Christ Superstar, Tommy, Phantom of the Paradise and Rocky Horror, it seemed like rock operas were the wave of the future. My life plan was to grow up, get a job with Creem magazine, marry Elton John and write rock operas with him. David Bowie was my main musical influence, and I spent most of the early-mid 70s listening to his science-fiction themed albums. It’s safe to say this rock opera would not exist without the inspiration I drew from Bowie’s music and ideas. On my 58th birthday, I decided to finish the rock opera. I dragged out the old “sacred texts” as I called them, perused the songs that I’d written, and pondered the lyrics that had never had music assigned to them. I knew it needed more, and then, to my surprise, I realized that a flurry of songs I’d written in 1980 (when I was obsessed with androids and mutants) filled out the story line perfectly. I was equally happy to discover that some piano songs I’d written over the years, with no lyrics, happened to fit perfectly with some of the lyrics that had no music…. I enlisted the collaboration of Mark Putt, a dear friend and genius song writer I’d worked with before, and he wrote guitar-based melodies for many of the songs still needing music. 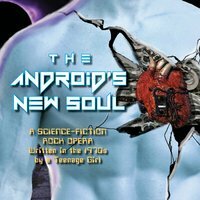 Then I set about hiring singers and musicians to bring The Android’s New Soul to life. The story hasn’t changed since it came into my head in 1974. I only wrote a few new songs to finish the project. I hope you like it!